I did not go to hospital. Let’s be clear about that at the outset. It’s important that you don’t suffer undue stress when you read the Berra Circular. And now, here’s what did happen. The other week, I finally expanded my modes of transport. 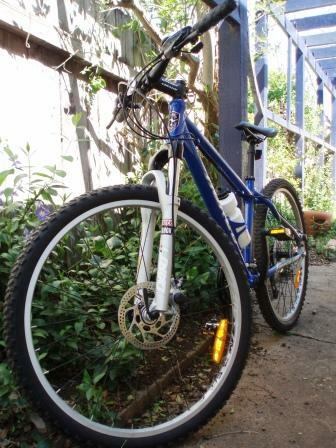 I bought a new bike. This was no simple matter, you understand. I had every intention of refurbishing the midget Giant, which I’ve dragged through countless residences in three states and which has served me well. You may remember those halcyon days back when we lived a hand-to-mouth existence and the old girl was my principle mode of transport – never mind a car, I got it before I even earned a car license. She’s been in mothballs these past few years, getting very little workout in the New England and not at all on the punishing hills of Slobart. So It was with great sadness I received the news that her repairs would cost me halfway towards a new model. So far she’s been on a couple of trips to the Saturday Farmers’ Market. I’m easing into things, okay? This weekend just past was glorious, with spring exploding across the Berra in a burst of sunshine and warmth. I burst into spring with a crippling dose of hayfever. How nice it is to be inland again. Now, what does someone sensible do on a glorious, hayfevery weekend? I’ve no idea. I went to work – at an outdoor broadcast at the opening of Floriade, one of the nation’s biggest flower festivals. Not only was I at the salt mines on my own time, I sneezed and wept my way through it all. After a few hours of this, I might well have retired to spend the afternoon in a darkened house armed with the weekend newspapers and a box of tissues. But noooo, the Bald Man is here and he pointed out it was perfect weather for a bike ride. It was too. So we had a nice little pedal to Civic and then the Gorman House markets for lunch and a wander. Lovely. It all came unstuck, or at least I did, on the way home. I pressed the bike a bit too hard, changing down gears while turning a corner and pedalling hard uphill, and the chain came off; suddenly I found myself furiously pedalling air. Now, if I had simply put my feet on the ground at this point, all would have been fine. But I couldn’t. Because they were laced into cleated shoes which were clipped to the pedals. I tried repeatedly, vainly, to unclip my right foot even as my sorry carcass tipped inexorably to the asphalt. It was the shouts of pain and rage that drew the Bald Man back to the tangle of limbs and metal smeared on the road. I was absolutely furious – I can’t remember the last time I’ve fallen from a bike. As I roundly abused the Bald Man for insisting I buy the cleats, he noticed the blood seeping through my pants. I gingerly rolled up the leg and we were greeted by the sight of mangled meat. I had gouged my right thigh quite thoroughly, and could barely walk. I could, however, ride – and so I did. Cursing and weeping, all the way home. 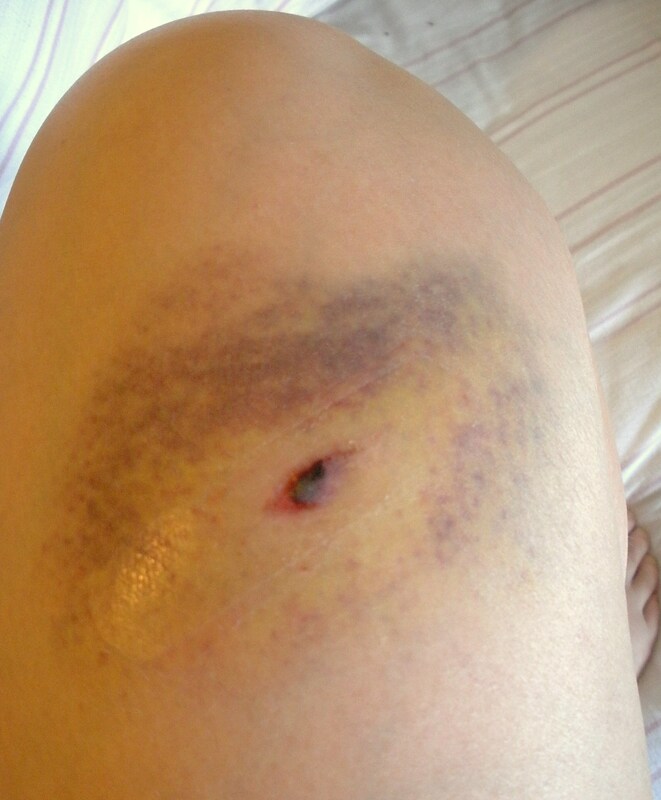 My leg is swollen and turning a marvellous shade of purple around the gouge, which still bleeds intermittedly. I have to take care it doesn’t turn septic. But apart from a few other bruises, a scraped knee and terriby wounded pride, I think I’m okay. At least I didn’t end up in hospital.